Take ten minutes with your family each day to prepare for Easter. This flexible, easy-to-use Lent devotional will allow both adults and children to celebrate the limitless wonder of Easter. Walk through Luke’s Gospel and the Old Testament to discover why the story of Jesus' death and resurrection is the most amazing story ever told. This is a discussion-based resource with differentiated questions for 3-4s, 5-7s, 7-12s, teens and adults! At just 10 minutes each, these devotions are an achievable joy, not an unrealistic burden. There are five devotions for each week. If you can't get to it every day, that's all right. Stuff happens. We hope that if you miss one you can pick it up again easily. You might discover that five a week is an unrealistic target—if so, some studies have been marked as KEY to help you choose which ones to pick. Shout as Jesus rides on a donkey into Jerusalem as the returning King. Listen as an innocent man is sentenced to the ultimate punishment. Mourn as the King of the Universe dies. Share the relief that Christ’s pain brings us into his Kingdom. Watch as the King rises again. Imagine the hill outside Jerusalem as the disciples watch their best friend rise to rule in Heaven. Discover the greatest story of human history. Christian family devotions—regular, simple, shared Bible times around the table—are a precious challenge throughout the seasons of family life. The what and how of starting (or re-starting!) can be the first hurdle. Ed Drew to the rescue! “The Wonder Of Easter” makes it so easy for families to plunge together into the Bible with a series of family devotions that are accessible (10 minutes, 5 per week), realistic (key studies highlighted for when you miss some), flexible (pre-school to teen options) and biblical (it’s built around Luke’s Gospel.) 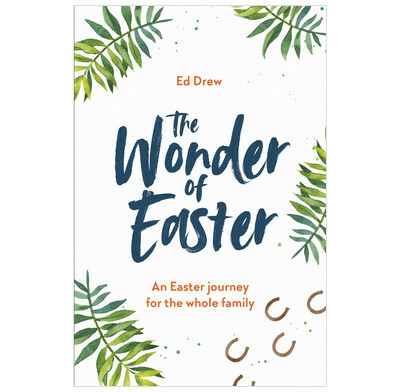 Using his experience as a father and formidable children’s pastor, Ed has created a book to blend into the background as your family encounter the Easter adventures of Jesus together. Open this book after dinner tonight and head off with your family on a day-by-day shared Bible adventure of your own that will, by God’s grace, shape the hearts and lives of a generation. Without fuss or labor, "The Wonder of Easter" deftly guides families through Jesus’ last days with both Old Testament and New Testament references. I’m grateful to Ed Drew for creating such a rich resource to help families like mine prepare our hearts for Easter and stay centered on the passion and resurrection of Jesus! The death and resurrection of Jesus are the very heart of the Christian faith. This engaging new resource will help families hear the Easter story together from Luke’s Gospel. Requiring just ten minutes a day, it provides readings, prayers, activities and questions that are tailored for all ages. It is biblically faithful, easy for parents to use, and will enable the whole family to delight in the wonder of what God has done for us through Jesus. It would be an ideal way to start, restart or refresh daily family devotions. This family devotion is really easy to use - they've even printed the bible passage in the book because they know what it's like trying to be organised while your children are around. There are a range of questions for different ages so it should suit families of all shapes and sizes. The Faith in Kids podcast really helps with it, too. Definitely listen to that. Thanks so much, Ed, for sharing your gifts and experience with us in this way.